Tokyo, September 26, 2017 --- Daikin Industries, Ltd.(TSE: 6367, Daikin) and Hitachi, Ltd.(TSE: 6501, Hitachi) today announced that, as of October 2017, they will embark on a collaborative creation aiming to establish a next-generation production model utilizing IoT*1 in order to support skill transfer from expert workers. As of October 2017, Daikin will introduce a system that utilizes advanced image analysis and other technologies-the solution core of Hitachi's IoT platform "Lumada" -to enable digitalization, comparison and analysis of the skills of expert workers and trainees in the brazing*2 process, part of the manufacturing process for air conditioners at Daikin's Shiga Plant (Kusatsu, Shiga Prefecture); with the objective of ensuring consistent quality, improving productivity and developing human resources at production locations worldwide.Daikin and Hitachi will jointly demonstrate the viability of a production model using this system, to begin full-scale operation of the system in actual manufacturing workplaces during this fiscal year, and aim to expand applications of the system to other Daikin factories and manufacturing processes worldwide. Starting from the joint demonstration experiment, Daikin and Hitachi plan to advance their collaborative creation towards the realization of a next-generation production model, in which global locations coordinate and share their information, skills and techniques utilizing advanced IoT. In recent years, as global competition is being intensified in the manufacturing industry, in order to swiftly respond to the rapidly change of market conditions, in addition to shortening product development time and achieving quicker launch to market, there is also a need to improve quality and increase productivity globally; and the skill transfer from expert workers is a kind of issues. In order to improve and equalize quality worldwide, Daikin has worked for many years to train new workers and transfer skills of expert workers, with efforts centering primarily around core skills such as brazing, lathing, sheet-metal working and arc welding; which are all essential to the manufacturing of air conditioners. 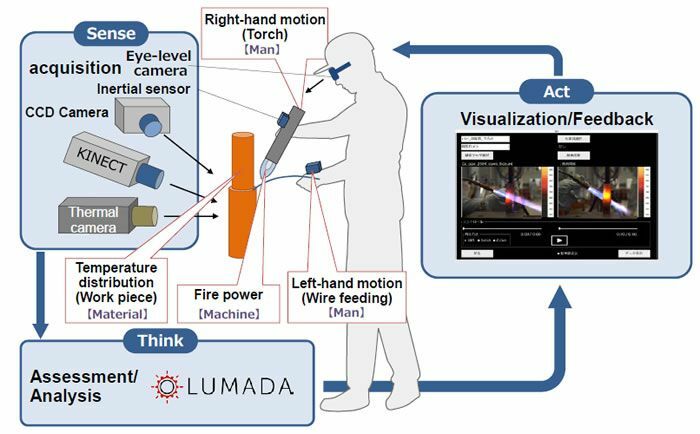 Meanwhile, Hitachi has worked to provide solutions that will raise the level of manufacturing capabilities (one of the key strengths of the Japanese manufacturing industry) through the application of IoT platform "Lumada" utilizing OT*3 , IT and digitalization of the manufacturing workplace utilizing the latest research and development outcomes, based on experience and know-how developed through Hitachi's own manufacturing operations. Hitachi considered that it could provide support for the efficient skill transfer from expert workers to a large number of workers by advanced image analysis that detects signs of deviations of workers' motion in front-line and facilities failures to quantitatively digitalize compare and assess the skills of expert workers and trainees.Under the cooperation with Daikin, Hitachi has conducted validation tests for the digitalization and modelling of workers' motions and use of tools, etc., in brazing processes in the manufacture of air conditioners.By analyzing data gathered from brazing processes from the "4M" perspectives of "Man", "Machine", "Material" and "Method", Daikin and Hitachi considered the extent to which the data could be linked to the creation of new production methods, and has now reached a stage where there is potential for applying systems for the digitalization and modelling of workers' motions and other phenomena to actual manufacturing workplaces. Based on validation tests conducted so far, Daikin and Hitachi constructed a Brazing Skills Training Support System that quantitatively assesses and analyzes differences in brazing work carried out by expert workers and trainees; and are now set to introduce the system to the actual manufacturing workplace at Daikin's Shiga Plant, and to begin joint demonstration in October 2017. Specifically, the system chronologically collects and digitalizes motion data-including hands of expert workers, torch4 angle and angular velocity5 , and the angle, distance and angular velocity at which the filler materials and workpieces are supplied-using cameras and sensors, and uses the data to construct standard motion models. Similarly, by gathering and digitalizing data on movements and characteristic phenomena occurring when trainees carry out brazing work, the system makes statistical comparisons with the standard motion models created based on expert workers' motions.This enables quantitative assessments of the brazing work of trainees based on the examples set by expert workers, allowing trainees to acquire the necessary skills in a shorter period of time, and enabling the company to seek to standardize and improve upon worker's skill levels; leading to improved consistency of quality, increased productivity, and enhanced development of human resources working on the front lines of manufacturing worldwide. Based on the results of these joint demonstration, by establishing unified standards for brazing work for introduction at all global production locations, and by integrating and analyzing data together with data from monitoring & control systems and production equipment, Daikin and Hitachi plan to further improve quality and productivity, and to train more skilled, expert workers. *2Brazing: A method of metal joining used for connecting components. By using a type of adhesive called a metal alloy filler material that has a lower melting point than the actual work pieces, brazing enables components to be joined without melting the actual work pieces themselves. *4Torch: A tool that is used to apply heat to the filler material to join components using a gas flame. *5Angular velocity: The rate of change in angle of a moving object (i.e. change in angle divided by time taken). Daikin Industries, Ltd.(TSE: 6367), headquartered in Osaka, Japan, focuses on the air-conditioning and fluorochemicals business. The Daikin Group operates in more than 150 countries, contributing to healthy and comfortable lives through the providing of air conditioners and wide range of other products and services. The company's consolidated revenues for fiscal 2016 (ended March 31, 2017) totaled 2,043.9 billion yen ($18.9 billion).The Daikin Group has approximately about 67,000 employees worldwide. Constantly refining the atomosphere- and environment-related technologies that it has developed since its founding, Daikin strives to both solve problems of society and expand its business.